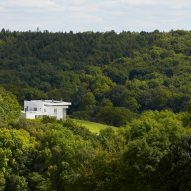 American architect Richard Meier has completed his first project in the UK, a characteristically bright white house perched on a hill overlooking the Oxfordshire countryside. 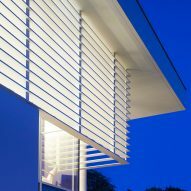 Initiated in 2007, the project known simply as the Oxford Residence has taken a decade to complete and has just been shortlisted for a RIBA Regional Award. Meier, 82, designed the home and its accompanying guesthouse for an anonymous client whom he met at an exhibition of his artworks in London. "I met the clients when I had an exhibition of my work in London. 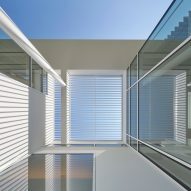 They came to the exhibition, and we met and talked, and they suggested meeting at a later date to talk about a new house that they were planning to build," Meier told Dezeen. 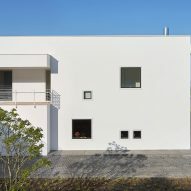 "They had very specific requirements in terms of the various spaces of the house, as well as the guest house adjacent to the main house," added the architect, who is one of the last practising 20th-century modernists. 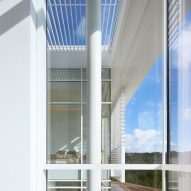 Meier drew inspiration from the traditional English manor house, placing the residence on the most elevated part of the site, where it can survey its bucolic grounds. 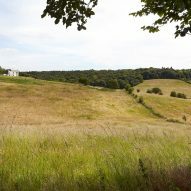 The 837-square-metre house and its 141-square-metre guest lodgings sprawl across the crest of the hill. Their concrete structures stand on a paved base and are uniformly coated in a layer of bright white render that contrasts the vividness of the pastoral landscape. 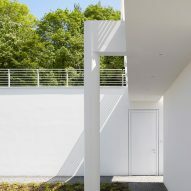 While the rear of the house is largely opaque where it backs onto a wood, expanses of glazing form the front facade that faces the open countryside. 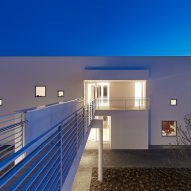 Sections of columnar glazing and clerestory windows lift the flat roof and side walls away from the rear facade, giving the house an appearance of being open or impenetrable from different approaches. 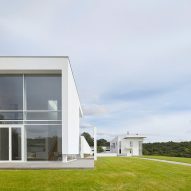 "The site is open landscape and the way the house is organised and situated would be like many English manor houses," said Meier. "So the siting and the context is related to the English manor houses of the past." "Our primary site goal is always to create a strong sense of place, by enhancing or transforming the existing site in a unique and provocative way," he continued. "Whether urban, or the open landscape, we search the context of each project individually for clues that inspire an idea about issues of organisation, scale, and location that provoke a strong dialog with its setting." 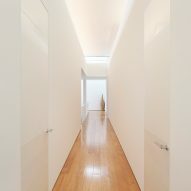 Inside, sections of opaque wall and glazing block or permit views, which gradually unfold towards the front of the house where rooms become increasingly more exposed. 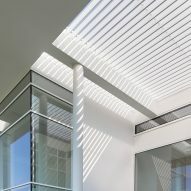 White-painted aluminium louvres run across portions of the gridded glazing, a detail replicated inside through the balustrades of the staircase and an elevated walkway overlooking the lounge. Hickory flooring adds a hint of warmth to the white spaces, which are dressed with white furniture and a handful of sculptures. 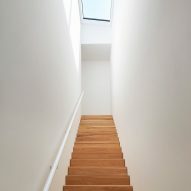 Utility spaces and a gym are arranged through the basement of the main house, with living areas placed at ground level and five bedrooms with en-suite bathrooms distributed across the top floor. 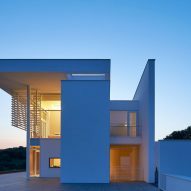 Here, a footbridge links the rear of the house with an outdoor swimming pool elevated on a higher part of the hillside. The self-contained guesthouse is detached from the main residence and has a bedroom, bathroom and an open-plan kitchen and lounge. 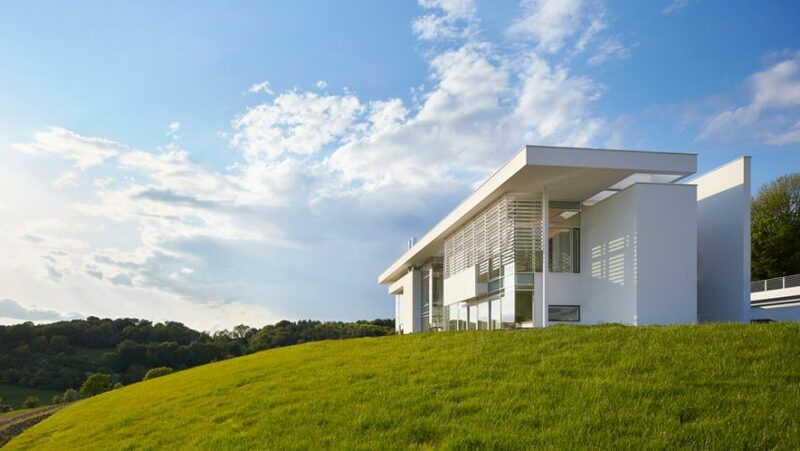 "Specific to the site of the house and the related buildings, the design seeks to integrate the landscape and views as part of its identity, bringing a natural balance between building and landscape," said project architect Kevin B Baker. 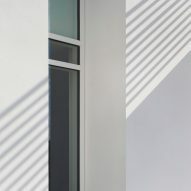 "Similarly, the layering of programme, walls and columns that dictate the interior layout are designed to complement the light and views specific to every vantage point, creating breathtaking common spaces." In an exclusive interview with Dezeen last year, Meier discussed New York's changing skyline. The architect said a new breed of skyscrapers – including BIG's "courtscraper" – show no respect for the scale of the city. The Pritzker Prize-winning architect runs his New York and Los Angeles-based practice with six partners. Collectively they have completed over 130 projects across America, Europe and Asia. One of Meier's earliest projects, the 1978 Douglas House in Lake Michigan was added to the USA's National Register of Historic Places last summer. 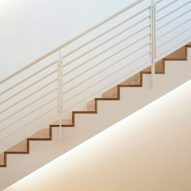 The firm, which came in at number 96 on the Dezeen Hot list, has recently completed a trio of residential buildings and two charter schools in downtown Newark and released a minimal lighting collection.